The Good Kind of Crazy: Love It or Chuck It! Love It or Chuck It! Yes, I used two titles. How many times can I say "chuck" and still be taken semi-seriously? I think I may have picked up this philosophy from a hoarding show 6 or so years ago when I still had cable television. We collect and keep things that are special to us, but leave them in boxes or storage and never appreciate them, and when that's the case - what's the point? I often clean through my house, go through corners of "stuff" I have been meaning to use and literally say out loud "use it or lose it!" Yes, it's lame - but it's effective and it is kind of fun. After my second child was born - I put his first outfit in a drawer with the first's first outfit. I took them out of the drawer, snuggled them like a total creep, stuck my face in and inhaled deeply. I don't necessarily LOVE the outfit, but I love the memories they bring back. I knew I needed to love them better than to keep them in a drawer. I went to Michael's Art Supply during their Boxing Day sale when all their frames are 50% off (frames and photos are my true, deep weakness) and saw these shadow boxes. I thought - Huzzah! I can put little baby outfits in here and look at them every time I go to their room. That's the beginning and the end of the story - each child has their own box, with their little hospital bracelet next to the outfit. I'd like to note that my babies are hilariously big. My smallest newborn was 10lb 2oz, and his outfit is the only one that actually fits in the shadowbox. 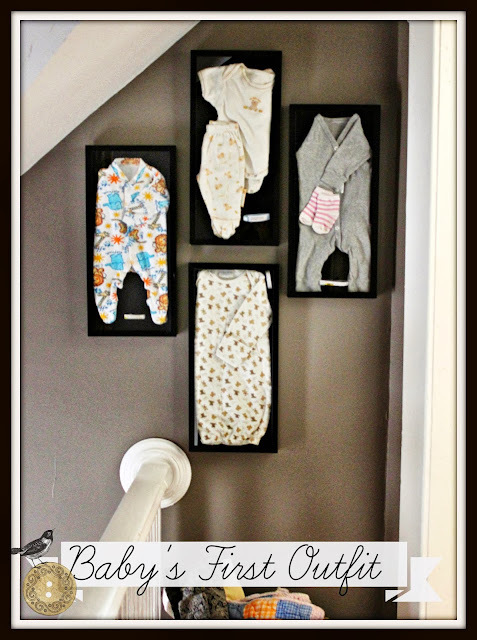 If your babies were anywhere under his 10lb you won't have a problem framing it in this size of shadowbox! So happy to share this pic of a copy cat! 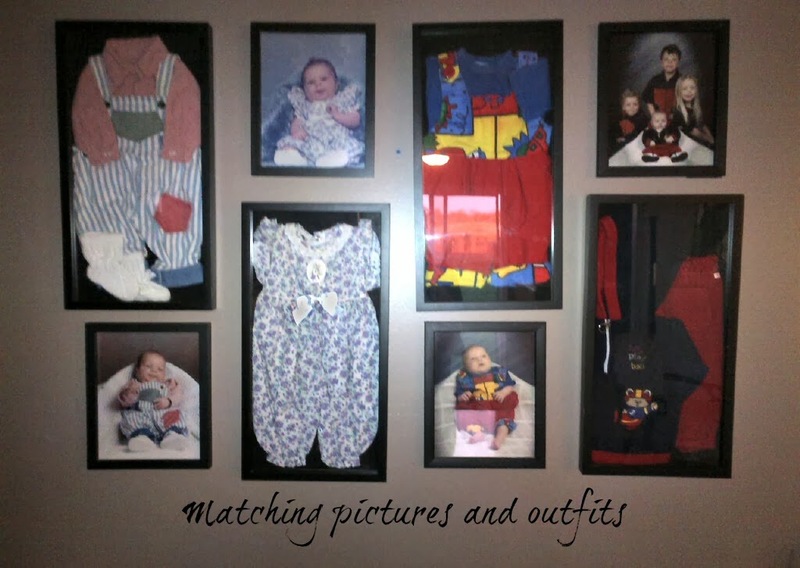 This takes the outfit one step further and has a picture of the child IN the outfit. I really love that idea, and may copycat it myself if I can find the pics! 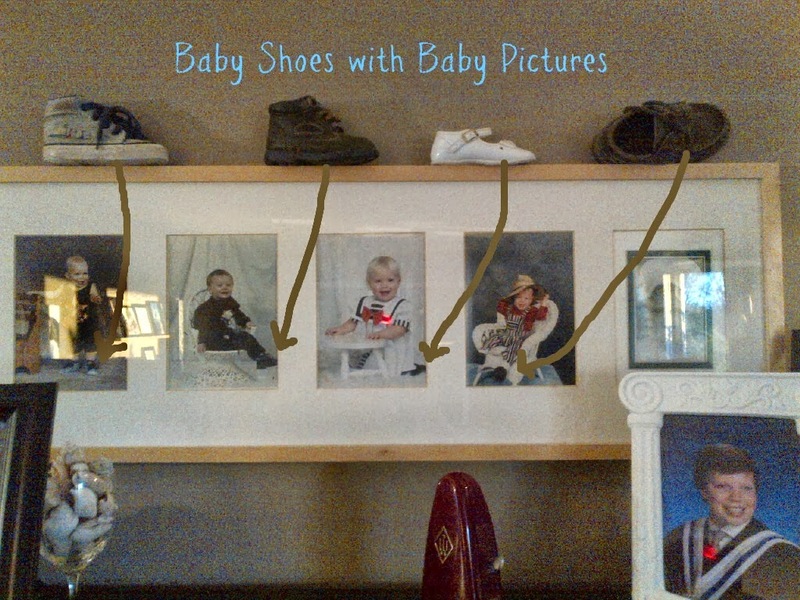 Here is the same idea with the shoe the child wore in the photo and the actual shoe resting on top. I have my kids first "Robbies" framed in little shadow boxes - maybe I'll share that on a later post. It's so great to share ideas on how to love our "things" better. Thanks for the photo contribution, and keep them coming! I totally copied your idea. 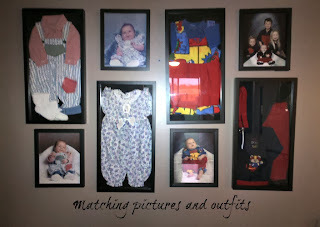 I had kept the outfit each of my kids was wearing when I took their one month picture, and inspired by your cute wall, made one myself. (Although, because preference is personal, I think mine is possibly even more awesome). I love being reminded of how little they were...and it's especially helpful to have a source of warm fuzzies when you want to wring your teenagers neck. Not that I've ever wanted to do that. In one of my "purge moments" I also found the shoes each of the kids wore in their one year picture. 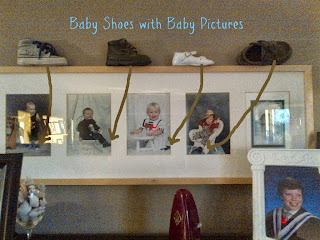 The picture shoe combo is one of my favourite spots in the house. I can vividly remember them toddling around in those shoes. And despite the fact that it sounds like I have closets full of baby clothes, I am pretty good at not keeping piles of stuff. I have just one rubber maid container of baby and toddler clothes. If you put some of your favourites out, it doesn't feel nearly as bad to get rid of your not so favourites.